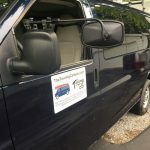 We have traveled 16,550 miles since starting The Touring Camper in 2014, journeying as far as Wyoming, Florida, and Maryland from our home base in Pennsylvania. And no matter where our travels have taken us through the years, making refueling stops at Pilots and Flying Js has always been a part of our adventure. We appreciate that along unfamiliar highways, Pilots and Flying Js are a familiar and consistent place for RVers to make a pit stop. Which is why Jarrett and I are excited to announce that Pilot Flying J is our official fuel sponsor as we venture this winter to Texas and beyond. 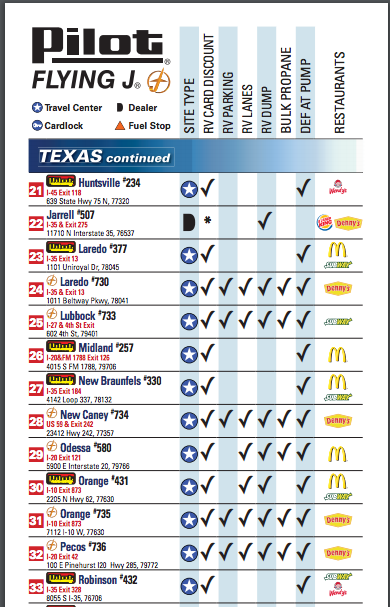 Pilot Flying J owns and operates over 700 travel centers and convenience stores nationwide. When we hit the road this week, we’ll be making regular stops at Pilots and Flying J’s to refuel, use the restrooms, and stretch our legs. 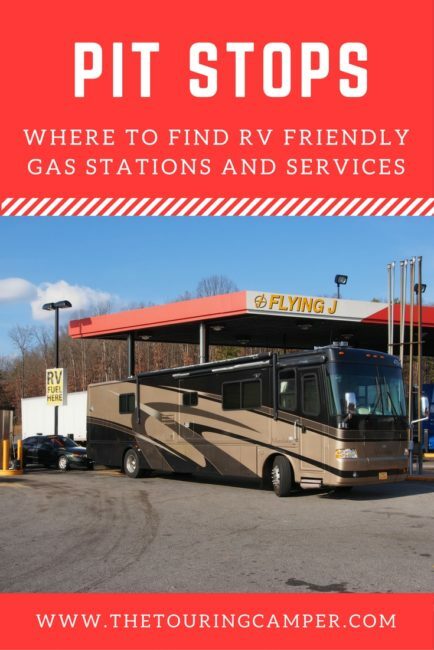 in addition to the spacious, RV friendly gas stations, Pilot Flying J’s great service islands offer RV fueling lanes, dump stations, and propane refills. Many sites also offer overnight parking for RVers looking for an easy spot to pull in and get some shut eye before hitting the road again. 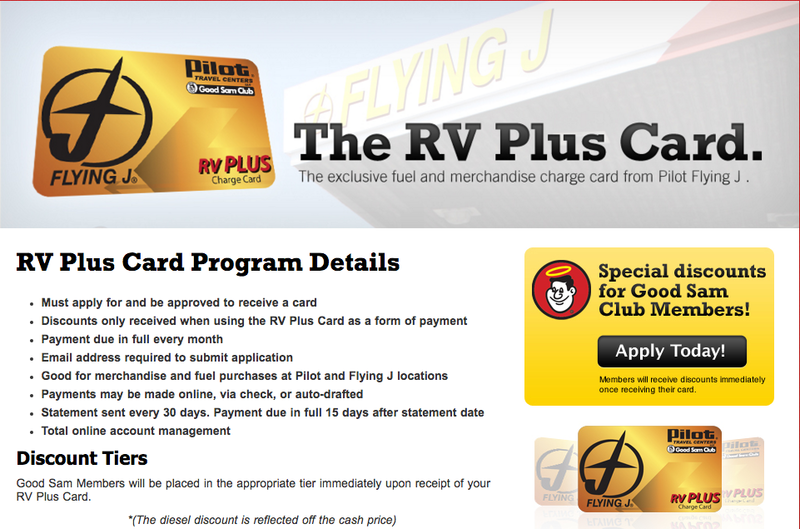 Pilot Flying J also has a handy app to make it simple for RVers to locate stations along their route, verify fuel prices, check what amenities are available at each location, earn rewards, and much more. 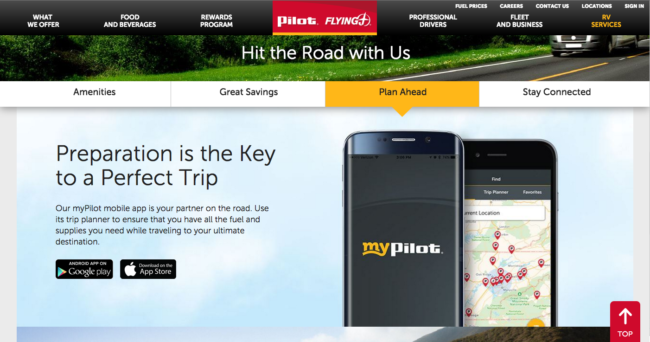 Drivers with the preferred loyalty account are eligible to receive a three cent gas or auto diesel discount when using the myPilot app. We just downloaded the app to our phones so we’ll be ready to use it on our Texas adventure, and the app says they will be adding even more features for RV guests in the future. 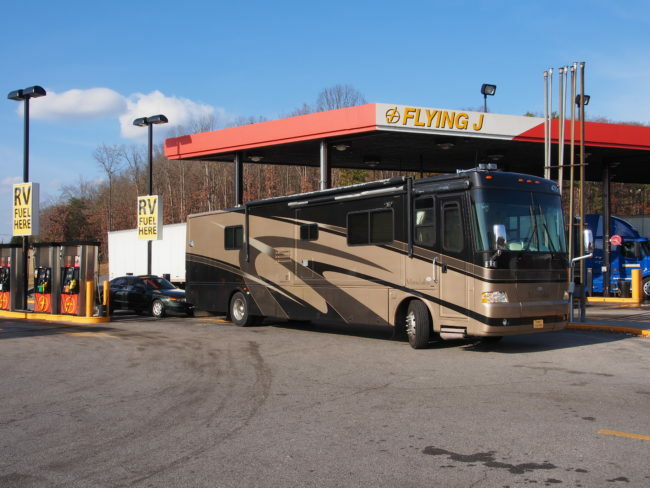 With so many services available to RVers, Pilot Flying J is an ideal fueling stop. 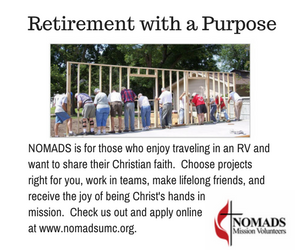 We’ll be posting daily from the road (as long as we have cell reception! ), documenting our winter adventure to Texas and our experiences stopping at Pilot Flying J’s RV friendly gas stations, so be sure to follow us on Instagram, Facebook, and Twitter so you can get the latest updates. (If you like hashtags, we will be using #thetouringcamper and #fueledbypilotflyingj on social media.) 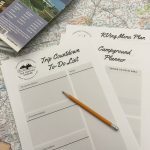 We invite you to come along with us as we explore the country while highlighting ways to make your next RVing experience the best yet as you embark on amazing adventures! I agree , Flying j’s and Pilots are great. 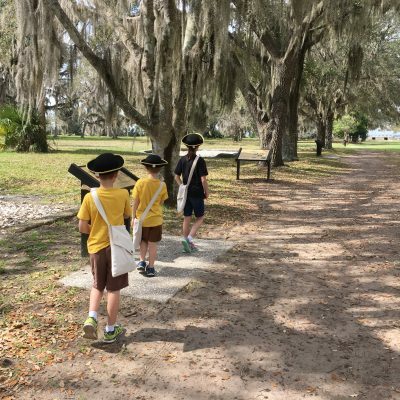 We route our trips around their locations. We sleep there , eat there, and fuel there at discounted rates. We have never felt unsafe at these locations. We prefer these to Walmart, which are ok but we prefer Flying j and pilot. Hi John! Thanks so much for stopping by and reading! 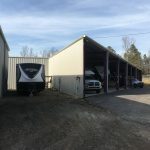 We haven’t yet spent the night sleeping in the RV at a Pilot or Flying J but we hear that some locations have RV overnight parking away from the big trucks. We’ll have to check it out sometime in the future! My husband and I travel West every winter. We ALWAYS look for Flying J stations. They are very rv friendly. We have found most Pilot stations are not. Hi Marge! Thanks so much for stopping by and reading! Yes, the more Pilots we stop at, we are finding that some are more RV-friendly than others. The newer ones we have stopped at seem to have larger fuel lane areas, which is always helpful with an RV. But we still prefer Flying Js when we are towing the camper. Very informative post(s). Thank you! 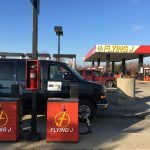 New to RVing but have used Pilot Flying J service stations for years traveling by car. 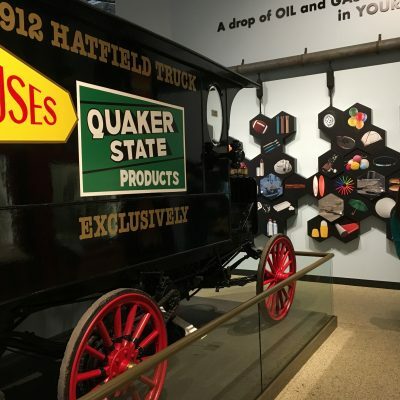 I do have a question…for diesel RVs, do you ever (is it allowed) use the truck lanes for refueling or always the “automobile” area at these locations? Thank you so much for the tips, we are new to RV’s and just towed a 32′ travel trailer from New Hampshire to Tennessee, it was very difficult to find RV friendly fuel along the way. We will definitely use your tips on our next journey. Hi Mark–thanks for stopping by and reading! Glad the info was helpful! If you can’t find a Flying J with the RV islands, another place that we found pretty good for RVs was the Love’s truck stops. All the best in your adventures! We always go to pilot or flying j’s…i have the app on my phone….love to travel, going to Michigan in October, New Mexico in nov, and Las Cruces New Mexico in Dec….flyin j…here we comw!! I am a Good Sam and a Flying J Pilot Rewards Member. 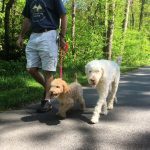 We just completed an 8500 miles trip through 26 States to Maine. We never used Pilot FlyingJ once. There prices even with the 10 cent discount are 10 to30 cents higher than competitive prices at other providers which include Valero, various Grocery Stores and Walmart. I am totally amazed than anyone still uses them with their pricing. Hi Paul–thanks for stopping by and reading! Yes, definitely agree on the price! 🙂 But it’s hard to find them right off the highway like we can find Pilots, Flying J’s, Loves, etc. When we are towing, we prefer quick on-and-off fuels ups.